Although little Miss Spider is having her own problems, we can COUNT on her to help us with some math counting! Read on for activities you can use in or out of the classroom. Poor, lonely, little Miss Spider. All she wants to do is have her insect friends over for tea, but they are suspicious of her motives. After all, spiders are known to lure other insects into their webs or even to ambush them from their hidden homes. So, as each passing insect is invited, they scurry away in fear, leaving Miss Spider bewildered. Then, in an unplanned act of kindness, she proves herself worthy of their friendship. 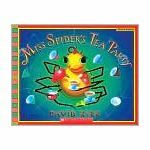 Miss Spider’s Tea Party can be read when you are talking about insects or when reading books by David Kirk. It has rhyming text and bright, full-page illustrations. For our lesson we are using the book for a counting activity as Miss Spider counts her visitors. Begin these lesson plans on Miss Spider's Tea Party by reading the story aloud. Remember to use your best “spidery" voice! The text in this book lends itself to a dramatic reading. Read it through without stopping to maintain the flow. 1. Why did the insects run away? 2. Do you think Miss Spider was trying to trick the insects? 3. How did Miss Spider feel when none of the insects accepted her invitation? 4. What happened to change their minds? 5. What lesson can you learn from this book about making friends? The next part of our lesson involves counting activities. 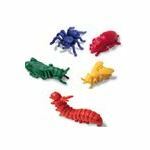 Plastic Counters - You can purchase a tub of plastic insects to use as counters or use plastic chips. Be watchful of any students who have a tendency to put things in their mouths. Sit students in pairs, in a circle on the floor around you. Place a pile of counters in the middle of the circle. Instruct every student to get six counters each. The pair of students will then have 12 counters all together. Ask the students to choose one counter to be the spider and put it on the cup drawing. Then have the students take turns moving the correct amount of counters as you read the book a second time. For example, when you read, “Two timid beetles—Ike and May—crept from the woodwork that same day," students should add two beetles to the cup. Ask them how many are in the cup. Students will then take two away when you read, “They shrieked, 'Oh no!' and dashed away." How many do you have now? Copies of papers with a spider web (offered here), one for each student. The following day do a similar counting activity, but this time, students will do this alone and will be taking it a step farther using addition and subtraction. You will be making story problems with the insect theme and writing the number sentence on the board. 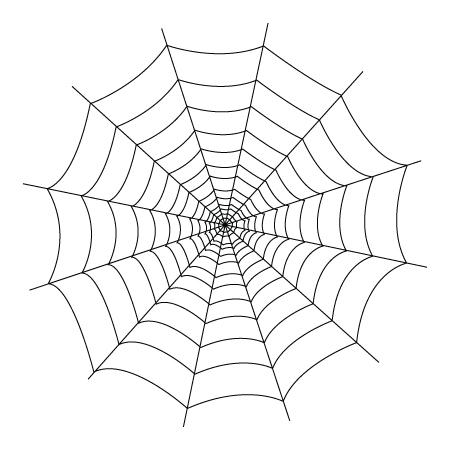 Seated at tables, students should have their 12 counters and the spider web paper. They should be able to see the board where you will write the number sentence. Say, "I’m going to tell you a story about Miss Spider and her friends. I want you to listen the first time and then I will read it again and write the numbers while I read. I want you to move the insects like the story says. Then I will ask you a question." 2. Four friends are at the party and then two more arrive. How many are at the party? 3. Six friends are at the party but one had to go home. How many are still at the party? 4. Miss Spider and four friends went out to play. Two of them flew away. How many are still playing. 5. Nine bugs are playing. Five ants had to leave for a family picnic. How many are left? 6. Four friends were in the web watching It’s a Bug’s Life on TV when five more friends came over. How many in all? You can COUNT on Miss Spider's Tea Party to be a fun learning time for your students, all thanks to little Miss Spider!